Yves here. These economists are worried about China for the same reason as Steve Keen: the rapid rise in private debt. China’s debt – in particular its corporate debt – is large by historical and international standards. This column argues that of greater concern is the sharp increase in recent years, and that the vulnerability is heightened by the concentration of this debt in old industries that suffer from overcapacity and weak competitiveness. The authorities appear to be only now taking steps to halt the rise in corporate debt, but as prior episodes of banking crises show, this is unlikely to be enough to avert either a prolonged period of slowing growth or a financial crisis in the medium term. A few weeks ago, official Chinese media announced that the government will carry out a debt-for-equity swap for the debt held by its state-owned banks in struggling companies, starting as soon as mid-September.1 The aim is to reduce China’s rising corporate debt, which at 171% of GDP is more than twice as high as that in the US. It is a policy the country used back in 1999 amid rising bad debts, but this time around the Chinese economy’s vulnerabilities are much greater. This matters not only for China but for the rest of the world and global markets too. China contributes roughly one-third of global GDP growth, and the IMF estimates that more than a third of equity and FX price moves in advanced countries are driven by news from China and other emerging markets (IMF 2016a). Prominent examples are the turmoil in global financial markets in August last year and January this year, both of which originated from downside news out of China. And it was no surprise that in its recently released Article IV report on China, the IMF warned Beijing to take concrete and immediate action to address its corporate debt problem (IMF 2016b). The big question is how close is China to the outbreak of a financial crisis. By referring to early warning indicators and previous episodes of banking crises, we show that China has entered a danger zone. Without bold and swift government action, a crisis seems more likely than not. 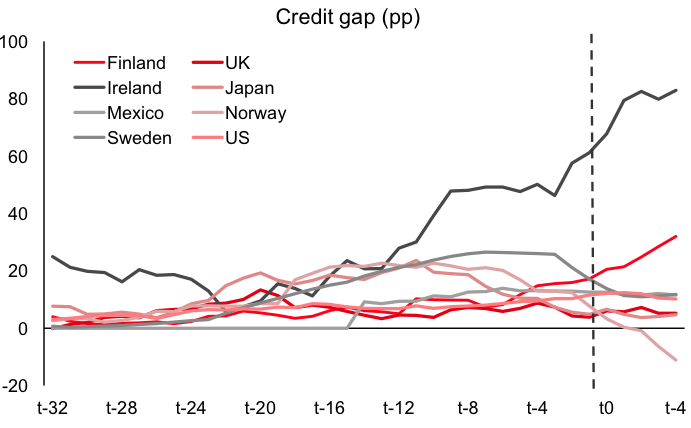 A small but growing academic literature has shown that the credit-to-GDP ratio relative to its long-term trend (the so-called ‘credit-to-GDP gap’) is the best single early warning indicator of financial crises (BCBS 2010).2 Credit is broadly defined as credit to the private non-financial sector (households and non-financial corporations) and includes non-bank and foreign funding. 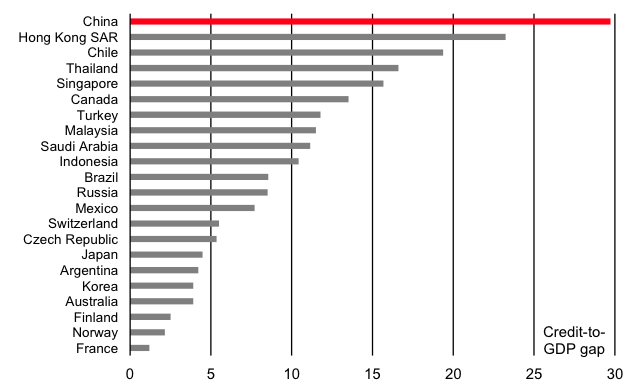 Figure 1 shows this measure for a number of advanced and emerging markets at the end of 2015, where we have focused on those countries reporting to the BIS whose credit-to-GDP gap is greater than zero. China tops the list. The natural question then is what level of credit-to-GDP gap signals a high probability of a future financial crisis? 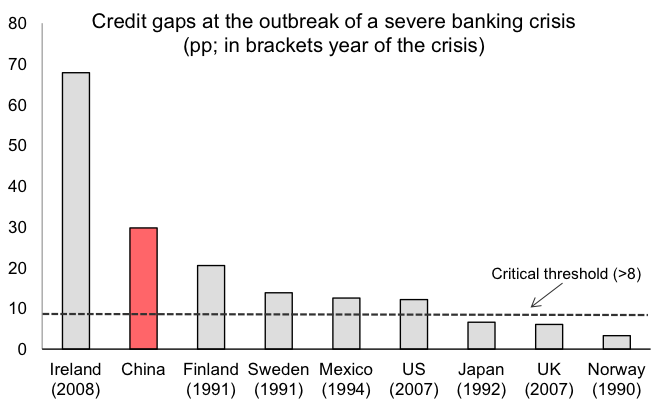 To get an idea, Figure 2 plots the credit-to-GDP gap in the quarter preceding nine severe banking crises. These are: Norway (1990), Sweden (1991), Finland (1991), Japan (1992), Mexico (1994), UK (2007), US (2007), Ireland (2008), and the Netherlands (2008).3 In many cases, the credit-to-GDP gap exceeded 8 prior to the onset of a severe financial crisis. In fact, the empirical literature suggests that a credit-to-GDP gap in excess of 8 is the danger zone (BCBS 2010). In China today, the ratio is at 30. It’s important to add that while the credit-to-GDP ratio is a good predictor of banking crises, it does not pin down the exact timing. The ratio can remain high for years before a crisis actually takes hold – if at all. Figure 3 shows the evolution of the indicator in the 32 quarters before the outbreak of a crisis for our sample of severe financial crises. From the figure, we see the build-up in the credit-to-GDP gap ahead of the crisis, but in some cases it eases (albeit from high levels) before the crisis actually starts and so it is hard to identify a trigger point. Although predicting the exact timing of a crisis is impossible, other indicators signal that vulnerabilities in the financial sector are mounting and are close to critical thresholds. First, debt service ratios (the ratio of interest payments plus amortisations to income) are 20% higher than the ratio in the US at the onset of the 2007/8 subprime crisis. Second, house prices have been rising very strongly, fuelled by a frenzy of borrowing, and this increases the exposure of the economy to a sudden drop in real estate prices. Third, a big chunk of credit goes to the old economy, where profitability and cash flows are slowing. Not surprisingly, amid industrial overcapacity and a slowing economy, non-performing loans (NPLs) of the commercial banking sector are rising. Officially, they amount to just 1.7% of total loans.4 But, these figures likely substantially underestimate the scale of bad debts. Unlike the vast majority of countries in the world, loans that are 90 days past due are not considered non-performing by China if the expected market value of collateral secured on the loan is higher than the loan itself. If we include so-called special mention loans (loans which are overdue but not yet considered non-performing), then the ratio would increase to 5.8% of outstanding bank loans, up from 3.5% at the start of 2014. And, the actual bad loans figure could be much higher, especially if one takes into account the ‘evergreening’ practice of rolling over debt where new credit is used to service existing loans. Assuming the ‘true’ level of NPLs is 5.8%, and given total outstanding bank loans are $12.3 trillion, then potential bad debts would equal $0.7 trillion, or 6.5% of China’s GDP, which is substantial for an emerging economy. As previous episodes of banking crises show, the sharp build-up of credit in the Chinese economy suggests a very high probability of a crisis in the next few years. Whether a crash can be avoided or not depends critically on the policy response of the Chinese government. In the three major banking crises that hit the country in the 1980s and 1990s, the one-party state was extremely willing to absorb part of the private sector losses. It now needs to act quickly to reduce corporate debt, strengthen bank balance sheets, and move the economy away from credit-fuelled investment in the ‘old economy’ and towards consumption. Debt-for-equity swaps, bank recapitalisations and the establishment of a market for the NPLs are all options on the table. Such a restructuring process of the banking system would result in a period of slower growth due to the credit contraction, but it would lead to a more sustainable growth model in the medium term. If, instead, the government continues to promote rampant credit growth, forcing banks to keep alive struggling state-owned enterprises, misallocating resources and deferring the necessary structural rebalancing, then a crash would seem to be unavoidable. “Challenges Loom for Debt-equity Swap Plan”, South China Morning Post, 31 August 2016. Following Borio and Lowe (2002), we compute the long-term trend of the quarterly credit-to-GDP ratio using a one-sided HP filter with a smoothing parameter of 400,000. The trend is estimated recursively; for example, the trend at time t is computed using credit-to-GDP data up to and including time t. The trend is computed using a minimum of 10 years (40 quarters) of data. BCBS (2010) identify these as severe banking crises using events such as bank runs, closures, mergers, recapitalization and large non-performing loans. According to World Bank figures, the world average was 4.3% in 2015, although there are differences in classification of NPLs across countries. This entry was posted in Banking industry, China, Doomsday scenarios, Economic fundamentals, Guest Post, Regulations and regulators on September 28, 2016 by Yves Smith. The real question is how much of the private debt is issued in RMB, or can be reasonably forced (on default) to restructure into RMB (i.e. how many off-shore holders of that debt). Chinese gov’t seem to be fairly ok with bailing in/out the companies (which has it’s effects, but to be honest, most of them are already baked in I believe), but of course it can easily bail out only RMB debt. Using its reserves to bail out USD debt is more problematic, as depending on amount, it could force it to abandon the peg (well, the “index”). This cheerfully complacent assumption deserves deeper examination. Bailouts invariably occur during a financial crisis, with the attendant defaults, bankruptcies, layoffs, economic recession and (in China’s case) probable social unrest over unpaid wages. But even now, pre-crisis, capital is fleeing China. Since it implies a currency depreciation, a major RMB-denominated bailout would accelerate capital flight. Likely this is precisely the scenario that motivates the current level of wealth expatriation from China. “Big hands” with insider connections know that a crisis is looming. And they know the crisis resolution will not be beneficial to those holding wealth in RMB. I’d agree on this – too much shallow reading of MMT has led people to think that covering domestic debts through financialising them is cost free. It can be done, but there are serious implications (Michael Pettis has run though these in great detail in his excellent blog). There will have to be a huge transfer of wealth within the country to cover the debts, and we all know that these costs end up being dumped on the politically weakest sectors. And as you say, major capital flight and devaluation would seem inevitable if that happens. I think the wealthy 5% or so in China have set up so many private money routes for protecting themselves in the event of something happening that full capital controls would be almost impossible. I can’t find the link at the moment, but I recall reading that the Chinese government has been encouraging companies to prioritise paying down dollar debt over RMB debt for precisely this reason. I have wondered though whether there is a significant amount of ‘hidden’ debt in foreign currencies which is not fully accounted for. As an example, many property purchases by Chinese abroad are made using foreign mortgages granted to Chinese living in the West, as paying down these mortgages quickly is an effective way of laundering money from dubious origins (the banks of course are almost certainly aware of this motive). This certainly happens in Canada and Australia. I wonder if some of those Anglo banks will find themselves high and dry for these debts in the event of a Chinese bank collapse. The “Red” Chinese have home court advantage, they can pick “capitalism” when it suits them and “communism” when that’s better. So SOEs get debt for equity swaps and get nationalized, ho hum it’s communism. Try that in the US when, say, we could have bought 100% of Citi common for $4B but instead we gift them $172 billion plus $2.5 T in loan guarantees. And they’re still a basket case. The only “communism” we get in the US is for the MIC, Big Pharma, Big Insurance, Big Prison, Big Surveillance, etc…but for the plebes it’s capitalist “creative destruction” all the way. And I’d add that China will choose the route that keeps social unrest to a minimum, that’s what really keeps them up at night. People there tend to head to the streets when they’re getting screwed. Unlike Americans who seem to prefer heading to the streets when the Big Dawgs are threatened-to protect the Big Dawgs. This analysis is fine but in my opinion it misses the point by centering it’s focus on just banking. State Owned Banks can be easily bailed out in China so the core of the problem is not the banking industry but how the all certain losses will be distributed along the economic actors (households, SOEs, SMEs, etc.) that in turn will depend on how the government navigates among their particular interests. It seems that the much needed bold Government action is already late and, so far, has been largely unable or unwilling to rein on SOEs and Real Estate companies. In my opinion the point is not to focus on bank recapitalisations or debt-to-equity swaps of banks but on when and how are they going to rein on credit and write down bad debt and if they will put the cost of it on SOEs (via privatisation, interest, debt-equity swaps, and interest rates), SMEs (interest rates) or households (further financial repression). Besides, hat about the shadow banking? Goodness, please stop with the hyperventilating about an almost certain banking crisis. Please see Michael Pettis’ blog where he asks and answers the question Does it matter if China cleans up its banks? The fact that bad loans overwhelm the capital of the banking system should not blind us to the fact that China’s problem is excessive debt in the economy, and not a banking system that risks collapse because of insolvency. Wolf does not mention it, but the Bank of International Settlements, which is the central bank to central banks, raised just the same type of alarm in the last month. So this is hardly “hyperventilating”. See Ambrose Evans-Pritchard, for instance: China facing full-blown banking crisis, world’s top financial watchdog warns. If this is what is meant by a “banking crisis,” then I will agree. All I am saying is that the form of a crisis is unlikely to be a collapse of the banking system due to insolvency. China has $20 trillion domestic savings, as well as over $3 trillions of Forex reserve. What’s the role of the domestic savings in all these? Does it matter how much saving there is in China as a percent of GDP? Banking was treated as just another business where they should maximise profit. They maximised profit but only had one real product, debt. The world became saturated in debt. A company that makes real products, like Apple, can saturate the market with one product but just has to come up with another product to keep the profits flowing again. The market is slowing down and saturating for the iPhone 5, time to bring out the iPhone 6. The banks have no “Debt 2” product. Also, its debt product has other characteristics that are hidden from general view. When the debt comes into existence, money is created, which increases the general money supply, increasing activity in the economy in general. With the ubiquitous housing boom, loads of new debt comes into existence rapidly increasing the money supply making the general economy boom. No productive investment is taking place and the prices of houses, that exist already, just rises. When debt repayments take place, money is destroyed, which decreases the general money supply, decreasing activity in the economy in general. As the housing boom slows down, the economy is burdened with very high mortgage repayments rapidly decreasing the money supply and dragging the economy down. The high mortgage payments and rent, greatly reduce disposable income and purchasing power into the economy. The mortgage has a very long repayment term ensuring this drag on the economy is very prolonged. As soon as debt repayments overtake new debt creation, you are entering a deflationary environment. As the money supply shrinks the debt gets harder to pay off and it is very easy to enter a deflationary spiral. In a world saturated with debt, the Central Bankers desperately try and keep the show on the road and encourage new borrowing, debt deflation looms on the horizon. It is best not to get into this situation in the first place. Banks are not like other businesses. Debt is not like other products. Unfortunately the world’s central bankers were asleep at the wheel.